The Democratic Republic of Congo appears to be anything but a peaceful, democratically progressingcountry. A few months ago the Independent Electoral Commission (IEC) in the DRC released a schedule wherein they announced the first round of governmental elections to be hold on the 27th November 2011. While the Commission and international Organisations such as the United Nations (UN) or the Centre for Strategic & International Studies (CSIS) prepare for the upcoming elections, mobilizing activities among different armed groups increase. The international Community as well as governments of neighbouring countries look with big concern at the developments in the DRC. The announced elections will be the second free elections in the history of the 50 years old country. Already in August this year, three months before the planed day of elections, independent observers doubted if the country would be prepared appropriately to ensure a peaceful process. It is questionable if the government is capable of guarantee a safe surrounding for the voters of the 70 million headed state with a size of Western Europe. The election motivates many people and many armed groups to go back to using guns as a way to try and gain power. The numbers are increasing and many ex-combatants are going back to the bush now: violence is what they know. Many of those who were demobilised were not accepted when they tried to go back into the communities – people were very angry – so they are easily recruited back to be with the bandits, and the militias are building strength. People are very fearful about what will happen in this next month. While in such areas as Kivu region an increase of recruitment and rearmament among rebel groups is observed, civil societies and human rights activists are worried about the safety of different candidates for this year’s elections. Vital Kamherhe from the Union Fait La Nation du Congo Party (UNC) told voanews.com the safety of political activists and candidates would not be guaranteed. 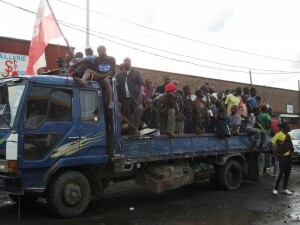 The danger of unorganized and chaotic elections in which the safety of the candidates and the voters cannot be guaranteed keeps both the international community and the Congolese population on their toes. Everybody seems to have the hope that the DRC is not going through a process of Ivoirianization. After the Ivoirian presidential elections last November resulted in a civil war, the fear is big that such developments could be repeated in the DRC. 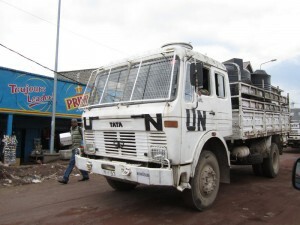 Beside all these worrying developments it is to be mentioned that MONUSCO, the world’s biggest UN peacekeeping mission, is still stationed in Goma. Although, Colonel Maktar Job said it is not the intention of UN soldiers to intervene in the region. However it is questionable how the international community and especially the neighboring countries as Rwanda will react in case of riots in the course of the elections.